Actress Shilpa Shetty rung in Karva Chauth festivities on the sets of Aunty Boli Lagao Boli, a TV show launched by the actress and her husband Raj Kundra. 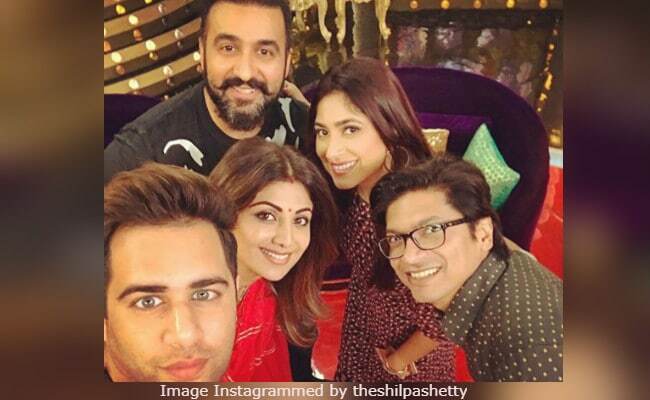 Shilpa Instagrammed a Karva Chauth special selfie from the sets of the show, featuring herself, Raj and singer Shaan, who made an appearance on the show with wife Radhika Mukherjee. "Karva Chauth on the sets of Aunty Boli Lagao Boli ..Thank you all so much," is how Shilpa captioned the photo. For Raj Kundra, the recent episode turned out to be one of the best so far. Re-posting the selfie, he wrote: "One of our most entertaining live episodes. Aunty Boli Lagao Boli rocks, so proud of the team! Thank you Shaan and Radhika for being such fab guests." Aunty Boli Lagao Boli, Shilpa and Raj's new show, was launched in September. Hosted by TV personality Archana Puran Singh, Aunty Boli Lagao Boli is a bidding game with a twist. While the audience of the show can just call to place their bid for the vehicle on offer on the episode, the lowest stand-alone bid with two decimal places will be the winner. Shilpa is also known to be a complete foodie and is guilty of posting videos of binging on sweets every Sunday. The actress, who often delights fans and followers with kitchen tutorials, shared the sweetest way to kick-start Karva Chauth festivities. Dry Fruits Fast Laddoos from the kitchen of Shilpa Shetty anyone? Shilpa Shetty and businessman Raj Kundra married in 2009 and are parents to 5-year-old son Viaan.